Even though I'm happily married to Mister L. Flutter, I like to try out other products as well. NailXL was extremely kind to offer me this cuticle oil by Entity, so I went ahead and tested it for a couple of weeks, all on its own. For me, one of the biggest disadvantages of using cuticle oils, is the mess they can create. Since this oil comes with a pipette, it's real easy to use! The oil also absorbs fairly quick, another major plus. The scent is quite pleasant, even though I think it smells like a mixture of acrylic powder, avocado and apricots. I think it reminds me a little bit of beauty parlors, which is a good thing! Unlike the last cuticle oil I tried, this one isn't filled with crappy, cheap, mineral oil. The ingredients are actually pretty decent, score! I've used this everyday and maybe it's just me, but I think oils just aren't right for my hands. It wasn't bad at all, but creams and balms seem to moisturize my cuticles better. Somehow, my cuticles always end up a bit dryer than I'd like after using cuticle oil for a while. But, if you're someone that prefers oils over anything, I'd totally recommend snatching this one up, because it was one of the better cuticle oils I've tried so far! 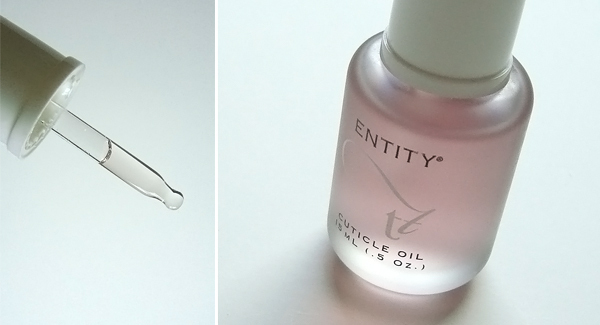 You can order Entity Cuticle oil for 8.50 EUR (15ml) at NailXL. NailXL also carries an impressive range of Nfu Oh, CND, Konad and other products, so make sure to take a peek!